Princes Street Gardens is a huge public park in Edinburgh, Scotland. The gardens link the castle with the shopping area around Princes Street and there’s plenty to see and do in them. There are the usual flowerbeds, pretty borders, trees and grassed areas you’d find in most parks but there’s also a large amphitheatre here which is known as the “Ross Bandstand”. It’s often used in the summer for outdoor entertainment and becomes a focal point of the park when it is. Another feature of the gardens is the Ross Fountain which you’ll find in the western end where it has been since 1872. It’s quite ornate for a city park and is made up of a collection of iron figures depicting science, the arts, poetry and industry. 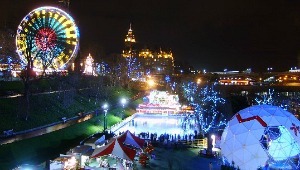 At Christmas, the park is usually contains a funfair near to Princes Street, complete with outdoor ice rink and Christmas gift stalls. Even if you don’t want to spend a lot of time in the gardens, they’re full of pathways linking all the surrounding roads and bridges and they provide an attractive short cut from one place to another. One thing that makes the gardens different is that they are dissected in two by the railway line, this almost look like a child’s train set when you’re standing next to the castle. From the castle side of the gardens you get a view of most of Edinburgh’s main shopping street, Princes Street, but on a clear day you can also see the Firth of Forth behind. Princes Street Gardens is also home to the two beautiful buildings which make up the National Gallery of Scotland which is definitely worth a quick visit. Even if paintings aren’t your thing, entry is free, so if you don’t like what you see all it cost was your time, but we think there’s something for everyone inside with artists like Monet and Van Gogh. There’s also a nice gallery of pictures from Scottish artists and a fancy café too which looks out onto the gardens. The National Gallery is open daily from 10am to 5pm (7pm on Thursdays). Admission is free although a charge may be made for special exhibitions. Some special exhibitions come free with the Discount Edinburgh Castle Tickets.